Yogurt has become a booming product over the past four to five years. From a product that was once consumed only by the dedicatedly healthy, to a mainstream food enjoyed by all ages and across all demographics, it’s a category that continues to experience growth through innovative use of tube packaging, yogurt based drinks and beverages; and, just recently, the introduction of savory flavor combinations into the product mix. As a yogurt consumer, I never know what to expect in terms of flavor, texture or content. With the proliferation of styles, contents, and brands on shelf, it is (as in so many other categories) increasingly challenging to pick apart the distinguishing characteristics of the various brand options. 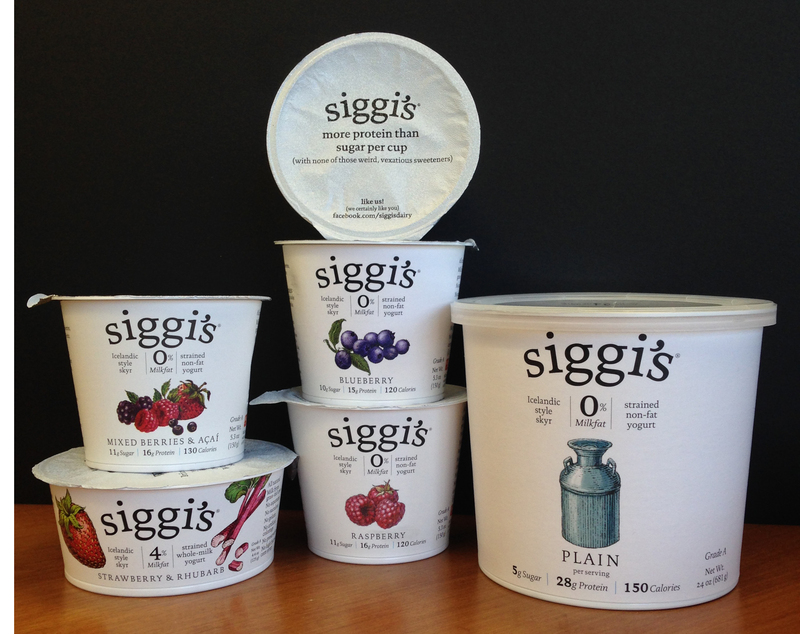 In fact, I sometimes feel that I need a buyers guide to make a smart decision when selecting a product – at least until I found siggi’s®. What immediately impressed me was the quiet impact and clarity of the package design across the product line. Based on an uncomplicated design grid and a color palette that is bright and purpose driven, regardless of size or format, the packaging is uniformly clear in communicating a product that promises no additives, preservatives, artificial flavors, thickeners or growth hormones. The design is essential – with the principle communication being the brand name and a botanical illustration referencing the flavor of the product. All other supporting copy fits in and around these principal components without distraction. On shelf, the impact of the package is notable because of its simplicity and direct communication, but the package goes much further than most, creatively using the tops of the yogurt packages to reinforce messaging on product features and content. Additionally, and unlike competing yogurt packaging, the carton label is easily removed allowing you to recycle the paper portion of the label separately from the carton and reveals a fully printed interior side detailing what differentiates Icelandic-style skyr from standard yogurt products. Everything about this package is free of pretense and distraction. Once again, the package with the most elemental design approach is the one that cuts through the clutter in its category. There might be those who feel the design is too elementary, or that it lacks the punch of competing packaging, but examined in the context of a retail shelf, surrounded by competitive variations on their themes, siggi’s® stands apart because of it’s quiet, direct communication approach.